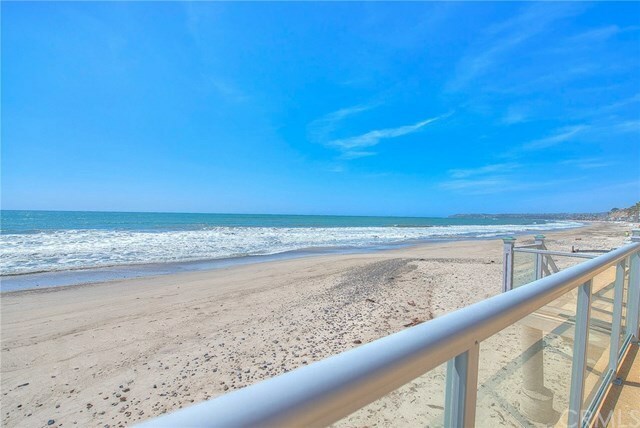 Welcome to this incredible newer construction on the sand custom home located in the exclusive guard gated Capistrano Beach oceanfront community with âPrivate Beachâ and âPrivate Roadâ. Incredible sunsets with ever-changing colors will captivate nightly. Unique 41â wide lot allows for 2 full-size master suites on the water, both with walk-in closets and sun-drenched private decks. Many opportunities to enjoy coastal living with 365-degree views from your private rooftop deck, and the sensational main floor deck with built-in BBQ, fire pit and wrap around glass. Some of the many highlights of this luxury home include 5 bedrooms each with a private bath, an elevator, a bright modern oceanfront kitchen, A/C, wet bar, entryway water feature, and unlike other beachfront communities, an abundance of parking for you and your guests. Beach Road is a unique oceanfront community that is guard gated with 24-hour security patrol where you own the beach to the mean high tide line. Enjoy your favorite cocktail, enjoy the sound of the waves, and never think about the crowded beaches elsewhere. Every time you drive through the gate you will undoubtedly feel youâve left the rest of the world behind. This is absolutely opportunity knocking for such a large home on the beach, built from the ground-up on Caissons just 10 years ago. This home will require some TLC, but once completed will have at a minimum a million in equity built-in compared to recent sales for newer homes on caissons.